I am a pretty huge fan of Tarte palettes, it's the brand I own the most eyeshadow palettes from, so it's no surprise that I ran to Ulta the day that their newest palette launched. This is the Tarte X Aspyn Ovard Eye & Cheek Palette and it's one of the prettiest palettes I have ever set eyes on. As usual Tarte completely hit it out of the park when it comes to packaging, really making this a beautiful and super girly palette. This would def be a great one to display on top of your makeup area, if you are so inclined to do so, as it's absolutely stunning. The Tarte X Aspyn Ovard Eye & Cheek Palette is priced at $39 (quite a pretty good price if you ask me) and it is described as a romantic palette. I would sort of agree with that description, but I would also add "natural" to that, as in a romantic & natural palette. For me this palette is missing some rosiness or mauve shades to really make it romantic. Let's talk about the color story, which as you can see leans very light and natural. Obviously, it's exactly the type of shade range that Aspyn set out to create, this is probably a perfect palette for someone with her skin tone and style. And, that's exactly why it's very limited. If you have anything darker than a medium skin tone, then the majority of the shades could be too light for you. I have a medium skin tone and on me a lot of these shades look the same on my eyes. I've used it a few times and even though there are 9 shadows, my look comes out basically the same each time. There is only one darker shade, Road Trip, and it's not enough to balance the light shades. I would have loved a burgundy or burnt red/brown in this palette, just one more shade at least to deepen out a look and add dimension. I do really like the two cheek colors though, I think the blush is absolutely beautiful and it's a shade that is super versatile and very flattering. Tarte is famous for the blushes so I am not surprised that the blush is a hit. I also really like the tone of the highlighter, it's really pretty. There are a few shadow standouts as well: the shade Endless Summer is so beautiful, it's formula perfect. I wish Heart of Gold was that same formula as I was so excited for that shade, but Heart of Gold is super crumbly and messy to apply. I am not someone who fancies wetting their shadows so this shade was disappointing. I also like Tea Time and High School Sweetheart, but again, on my eyes they look practically the same. I did like the formula of the shadows overall, minus Heart of Gold, they are the same Tarte formula I have always enjoyed. The shadows are soft so you can expect fall out, but overall I had no problem blending and found no patchiness in any. Fall out is not a deal breaker for me and I am used to this formula. Whether the palette is worth the $39 depends on your skin tone and how much use you would get out of it. I think this palette has a customer base, those girls and gals that want a very easy, wearable look. In fact I can see this palette being someone's everyday go-to. With the beautiful blush and highlight, a shimmer on the lid and a matte on the crease, one could create a gorgeous everyday look. 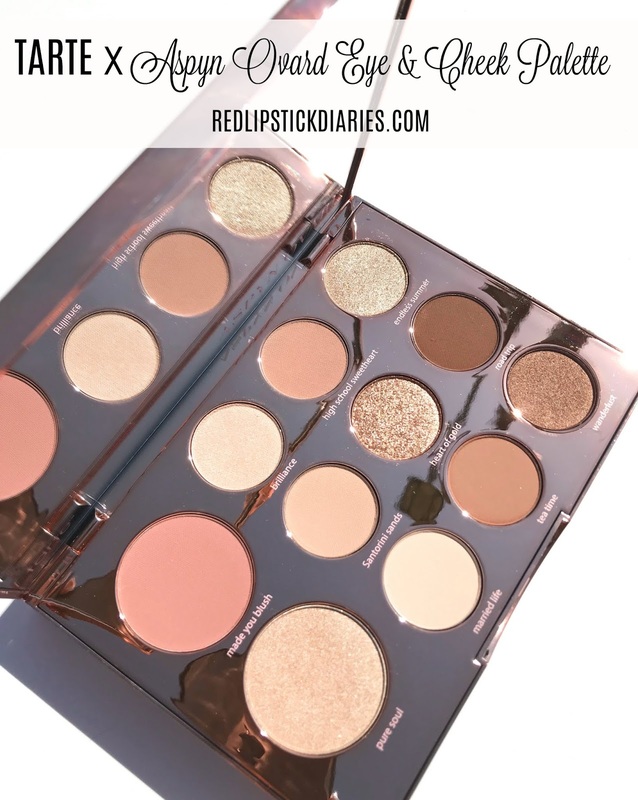 It's def a no-fuss palette, which are usually my favorite type of palettes. But unfortunately, the color scheme doesn't offer enough variety for me. Swatches of the Tarte X Aspyn Ovard Eye & Cheek Palette in outdoor light. As you can see the blush and highlight (bottom two) are SUPER pretty. But the 9 eyeshadows offer very little variety, especially when you actually apply them on the eyes. I would have added one more deep shade and a mauvey shade, that would really give it more of a "romantic" feel. Or even something more rosy, I don't really think romantic when I look at these shades, I think natural. 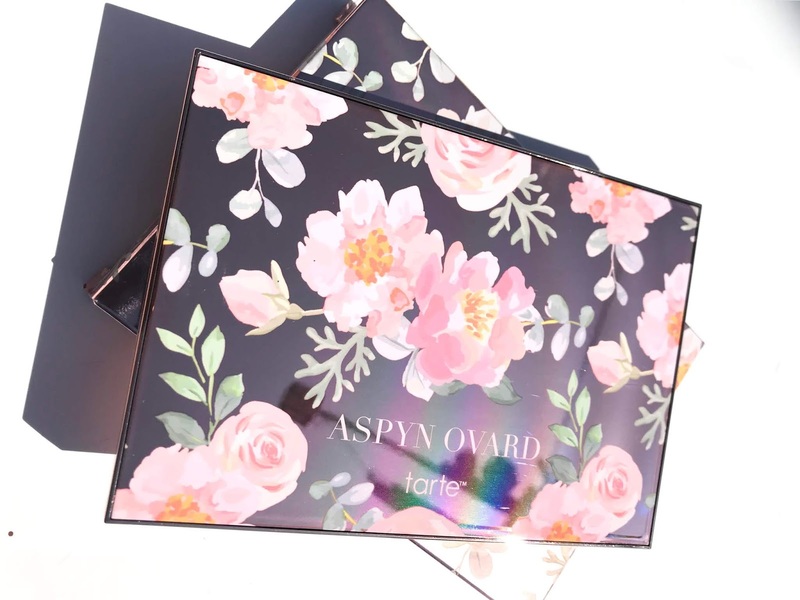 I don't think Tarte or Aspyn Ovard will be surprised at people's reactions to this palette, as they seem to have set out to make a very light and neutral palette. Being such a fan of Tarte, I was willing to give the palette a go, but after trying it a few times and coming up with the same look each time, I will be returning it. I do love one shadow, I like 2 others and I love the cheek products, but that's not enough to warrant the price tag, for me. While the Tarte X Aspyn Ovard Eye & Cheek Palette didn't work for me, I do think it has an audience that will enjoy it. Plus, I think the price is reasonable, comparing it to their Tartelette Palettes. I hope my swatches and thoughts help you decide if you want to pick it up. Shop for the Tarte X Aspyn Ovard Eye & Cheek Palette at Ulta. *Purchased made through links in this post go directly back into this blog, helping me to bring more swatches and reviews, to you. Thanks in advance if you decide to support my blog through your purchases.